We’d love your help. Let us know what’s wrong with this preview of The Ghost of Jamie McVay by R.G. Ziemer. Brian Krueger has a lot of problems: The death of his grandfather and his father's alcoholism have led to hard times and a move to a new town, where his nearest neighbor is a pyromaniac and a bully. Brian runs to escape his troubles, but it's on the gravel jogging path that he encounters the ghost of Jamie McVay. 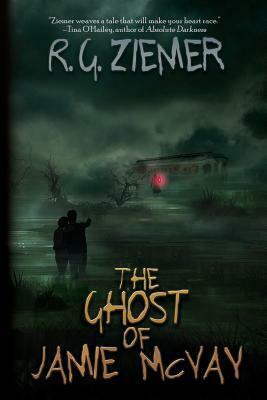 Brian and his new friend, Sharon, investigate the ghost's ori Brian Krueger has a lot of problems: The death of his grandfather and his father's alcoholism have led to hard times and a move to a new town, where his nearest neighbor is a pyromaniac and a bully. Brian runs to escape his troubles, but it's on the gravel jogging path that he encounters the ghost of Jamie McVay. Brian and his new friend, Sharon, investigate the ghost's origins. Clue by clue, secrets are revealed as the teens discover the truth behind Jamie McVay's quest for redemption. Along the way they must deal with teen issues such as school, sports, friends and rivals. Brian also struggles to reconcile with his father, while facing dangerous Pete the Pyro..
To ask other readers questions about The Ghost of Jamie McVay, please sign up. The Ghost of Jamie McVay is a great read. As the back of the book says: Brian has problems. He has to adjust to a new town and school. His father is an unemployed drunk. His neighbor is a pyromaniac bully. All these problems combine with a ghost who was involved in a gruesome train wreck in an intgiuing and quick-moving plot. The book is categorized as young adult, but I feel it has appeal to a wider range. Recommended. Take a fun and fascinating trip back to high school! While dealing with more than his share of teen angst, Brian encounters a cast of unforgettable characters that will stay on your mind long after you've finished this modern day ghost story. But while dodging bullies and trying to solve a haunting mystery, Brian meets a very special girl. Highly recommended! Like Stephen King by way of S.E. Hinton, The Ghost of Jamie McVeigh is a novel that reveals the prickly difficulties of being a teen like they were the eerie details of a campfire tale. Zeimer has given us a wise and poignant story about the loneliness of adolescence and the frustrations of knowing what can't be shared. It is about the losses that haunt us, the things a place can teach us, and the local legends so strange they just have to be true. It is a book about what is passed down, what li Like Stephen King by way of S.E. Hinton, The Ghost of Jamie McVeigh is a novel that reveals the prickly difficulties of being a teen like they were the eerie details of a campfire tale. Zeimer has given us a wise and poignant story about the loneliness of adolescence and the frustrations of knowing what can't be shared. It is about the losses that haunt us, the things a place can teach us, and the local legends so strange they just have to be true. It is a book about what is passed down, what lingers, and what won’t go away even after it dies.